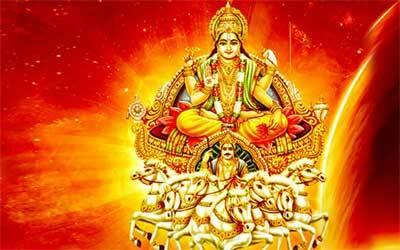 Bhanu Saptami, also known as Surya Saptami, is an auspicious day dedicated to Lord Surya. Bhanu Saptami 2019 dates are January 13, May 26 and November 3. Lord Surya, or the Sun God, is an important deity in Hinduism and is worshipped daily and on Shukla Paksha Saptami (the seventh day during waxing phase of moon in a traditional lunar calendar). Bhanu is one of the numerous names of Lord Surya. Lord Surya, or the Sun God, is Pratyaksha Brahman or the visible god and is worshipped daily and on Shukla Paksha Saptami (the seventh day during waxing phase of moon in a traditional lunar calendar). Bhanu is one among the numerous names of Lord Surya – hence the name Bhanu Saptami. Bhanu Saptami is observed in Magh Month (January – February), Falguna month (February - March), Jyeshta Month (June – July), Kartik month (November - December) and also in Margashirsh Month (December - January) by different Hindu communities. The main Bhanu Saptami is held in Magh month and is known as Magha Saptami or Ratha Saptami. Bhanu Saptami in Jyeshta month is only held in some regions. It must be noted that Bhanu Saptami is traditionally believed to be the birthday of Lord Surya (or the first time Sun God made his appearance). Special prayers and rituals are held on the day in temples. The day is also known as Vivasvat Saptami. It is also observed when Saptami Tithi falls on Sunday or Ravivar as per traditional Hindu calendar. What to Do on Bhanu Saptami? Offer water to Surya and chant the Gayatri Mantra. The water should be mixed with red color flowers (लाल रंग के फूल) black sesame (कला तिल) , jaggery (गुड़ ) and rice (चावल). Water should always be offered looking towards east (पूर्व ). Even if you do not see the sun perform the ritual by looking towards east. Wear red color clothes while performing the arghya to Surya in the morning.